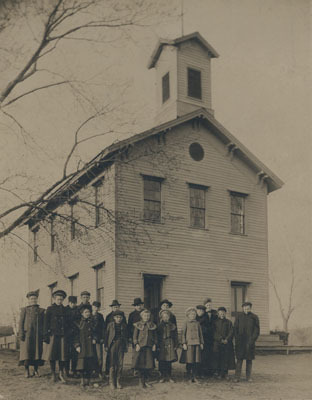 Lakeland School building and students. MODERN ADDRESS Co. Rd. 21 and 32nd St.
DISTRICT BOUNDARIES The St. Croix River marks the eastern border, surrounding the Lakeland area; just north of St. Croix Beach. NOTES *The building constructed in 1869 was a two story wooden building that cost about $6,000. *Before having a building, school was held in local homes. 1855: Tax of $300 voted to costruct construct a building1869: A two-story schoolhouse was built for$6,000. It’s 26 by 40 feet, wooden frame, and white. 1947: School burned down in autumn, no witnesses, and district became part of the Afton School District. Grades 1-4 were downstairs and grades 5-8 were upstairs – each grade had its own room. The upper grade teacher was principal. At one time student enrollmemnt was 100 (according to the Stillwater Gazette). By 1938, it was 42. Minnesota History was a subject in the 1930s.